Here are a few snapshots from our animal facilities. The monkeys are housed in small groups. In their cages they have a variety of toys and exercise furniture. This so-called “social enrichment” effectively helps reduce stress. As a result, our monkeys display normal behavior for the species. Group housing for the rhesus monkeys at the Max Planck Institute for Biological Cybernetics. Credits: Max Planck Institute for Biological Cybernetics. 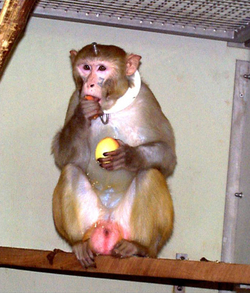 Rhesus monkey eating. The animals are given fresh fruit every day. Credits: Max Planck Institute for Biological Cybernetics. Rhesus monkeys grooming each other. The reclining monkey is wearing a light plastic ring around its neck and has a head post implanted. 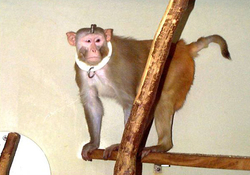 The post is fully incorporated in the monkeys’ natural grooming behavior. Credits: Max Planck Institute for Biological Cybernetics. Rhesus monkey three weeks after an operation. The hair around the implant is just growing back in. Credits: Max Planck Institute for Biological Cybernetics.